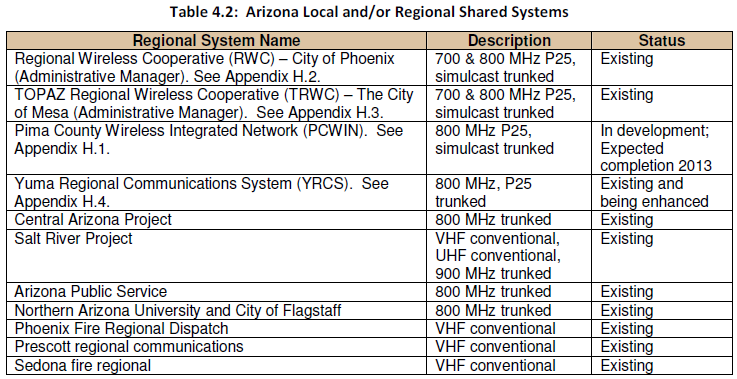 The Arizona Statewide Communications Interoperability Plan (SCIP) serves as a reference for public safety officials by describing the status of interoperable communications throughout Arizona and by documenting the specific goals and objectives Arizona has established to improve public safety communications. 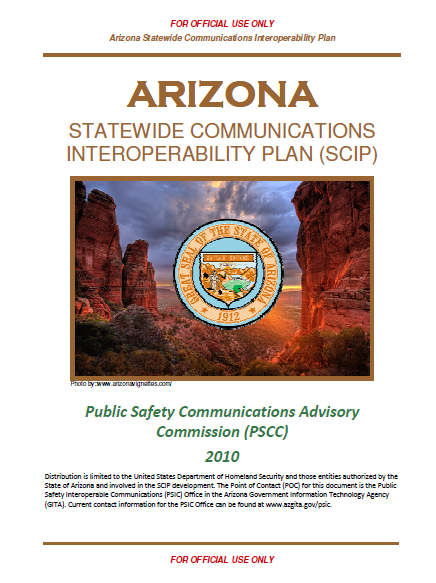 Arizona developed the initial version of the SCIP in 2007, beginning with a high-level plan introduced at a Statewide Interoperability Executive Committee (SIEC) meeting in July 2007. After a series of meetings and forums, this SCIP was approved by the Public Safety Communications Advisory Commission (PSCC) in an open meeting on November 28, 2007. 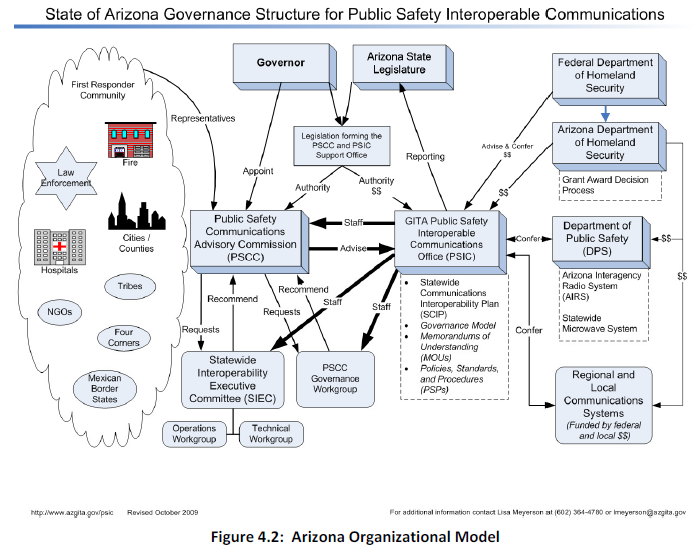 In July 2008, oversight of the PSCC transitioned to the Public Safety Interoperable Communications (PSIC) Office of the Arizona Government Information Technology Agency (GITA). The PSIC Office identified the need to update the SCIP in order to address known gaps in the Plan and to document updated approaches to tackling statewide strategic communications initiatives. This updated version of the SCIP was approved by the PSCC in an open meeting on January 19, 2010. 1. Introduction – Introduces and defines the purpose of the Plan. Emergency Medical Service (EMS) associations. 3. Methodology – Outlines the participatory methodology used to develop the SCIP. 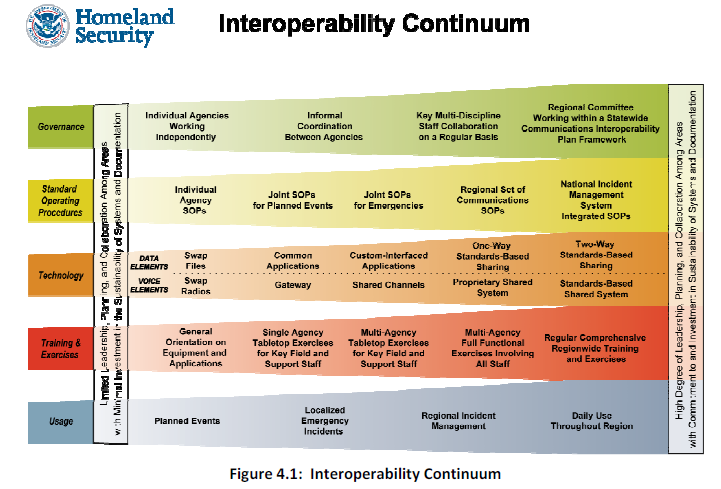 strategies for providing interoperability for public safety communications. with Arizona public safety and service agencies/organizations. of Agreement (MOAs) are described. compliance, and identifying current SOPs for interoperable communications. 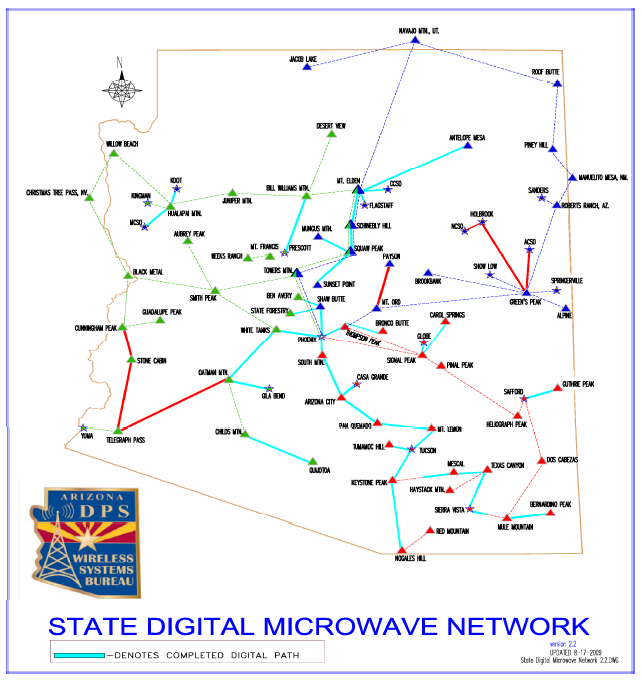 and radio caches in Arizona available to enhance interoperability. and vision and mission statements for improving interoperability are introduced. communications needs, based on risk-benefit models projecting evolving future requirements. retirement communities around the state, and the banking/finance sector. renewable water supplies in Arizona. three units capable of generating nearly 4,000 megawatts of electricity.